Here at The Shire Farm, we love our eggs. Scrambled, fried, hard-boiled, baked, shaked, in frittata, or whipped into cupcakes, you name it. We usually try to have 2 eggs and 2 slices of toast every morning if we can. Eggs are one of the highest quality protein of any food. They're an affordable, dense source of nutrition that can be prepared in a variety of tasty ways. What's not to like? 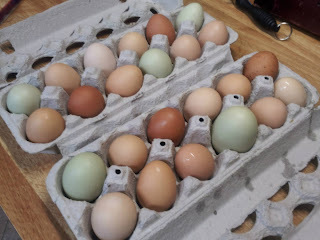 Until our chickens start laying, sooner rather than later hopefully, we've been getting our eggs from the store and from couple that raises backyard chickens in Lowell, MI, and you can tell the difference! While we wait for ours to start laying with eager anticipation, we thought we could explain why we chose to raise our chickens on pasture. Pasture Raised Eggs produce eggs with firmer yolks, with a stronger color and a richer flavor. When cooking you see that shells are stronger from a diet higher in calcium, they break more cleanly with fewer shards of shell floating in your breakfast. The yolks are stronger and firmer, so if you're a fan of over-easy eggs like us, you'll enjoy fewer broken yolks. Deep orange, the yolk stands up tall within the thick whites and their color, flavor and texture are distinct as each hens diet. Not only are you getting better quality eggs, you are also getting healthier and more nutritious eggs. Mother Earth News conducted an egg testing project and study in 2007, and found that eggs produced by truly free-ranging hens were far superior to those produced by battery cage hens on conventional factory egg farms. Eating just two of these eggs will give you from 63-126% of the recommended daily intake of vitamin D! All because pastured hens are exposed to direct sunlight, which their bodies convert to Vitamin D and then pass this on to their eggs. A bird's diet and lifestyle affects its health, flavor, and nutrition, as well as its eggs. Because the chickens consume a more natural, omnivorous diet that includes seeds, worms, insects and green plants, and get a lot of sunshine--because we allow them to live a chicken-like life--their eggs are substantially better. Because pasture-raised chickens have less stress and are naturally healthier than factory raised chickens, they are less susceptible to bird diseases, like Avian Flu. In 2006, the Center for Disease Control said, "When it comes to bird flu, diverse small-scale poultry farming is the solution, not the problem." For farmers, chickens can help us in this system by eating fleas, ticks, grasshoppers, spiders, slugs, mosquito larvae and almost every other insect. They can even eat small mice and snakes. This does mean that pasture-raised chickens are NOT vegetarians, because chickens are not naturally vegetarian. Besides keeping our pest population under control, their very presence on the fields, eating and pooping, provides manure and fertilizer for the soil, promoting organic matter and fertility. Being able to move their pasture enables a farmer to manage and direct the fertility of the land. Factory farm birds--both conventional and organic--never get to see the outdoors, let alone eat a natural foraging diet, and are kept in overcrowded conditions. Instead they are fed the cheapest possible mixture of corn, soy and/or cottonseed meals, with many additives. In conventional factory farms, chickens are often given antibiotics to keep the animals alive in this conditions and to promote faster growth, but it also promotes antibiotic resistance. Other substances such as chlorine, anti-depressants, and arsenic and others have been found in super market and fast food chicken. And we haven't even mentioned the environmental consequences of factory farming. "So, here is the deal. We create hellish conditions for our livestock, then we drug them to keep them numb. Then we drug them again to wake them from their pharmaceutical stupor. Then we drug them to grow faster. Then we drug them so their flesh will look healthier. Then we drug them to withstand the disease epidemics that our overcrowding has created. Then, of course, we drug ourselves every time we take a bite of factory-farmed poultry." The bottom line: Our lives and our food have become increasingly complicated by our enhanced awareness of the long-term consequences and ramifications of their production. Sustainable and healthy alternatives to the industrial factory farm system do exist. But it is up to everyone to make the change in their lives. Know your farmer, know your food. Make the most of your meat with stock!